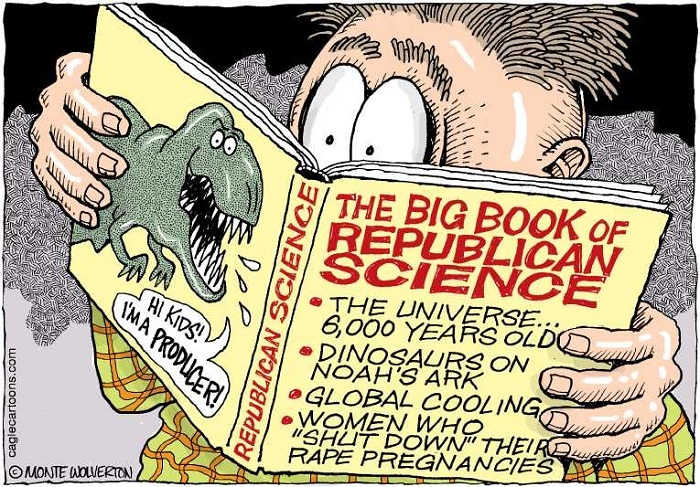 The Immoral Minority: Only 37% of Republicans believe in Evolution. However it seems that 100% of them think science is something you "believe in." Only 37% of Republicans believe in Evolution. However it seems that 100% of them think science is something you "believe in." Forty-nine percent of Republicans don't believe in evolution, a new Public Policy Polling survey found Tuesday. The poll by the Democratic-leaning firm found that 49 percent of Republicans said they do not believe in evolution while 37 percent said they do believe in evolution. Another 13 percent said they were not sure. So to be clear 62% of Republicans are not at all convinced that Evolution is a fact. And now since this last election these people are almost completely in control of our country. And people wonder why I have trouble sleeping at night. Thinking back to my school days, there was never a clear reason taught as to how the world sank into the "dark ages" after the fall of the Roman Empire. I hate to even think it, but are we as a society witnessing the start of another "dark age"? It seems in my life time I've witnessed where ignorance and stupidity are now traits that are worshiped by the masses over intelligence and common sense. I agree. I have never heard or seen such stupidity. People even have to have an app on phone to tell them how to dress for the day. Nobody can use the brain they were given. I think, they think, they will get brownie points for not believing in science and knowledge. I really do think it's just a backlash from a dying era of conservative religiosity in the US. The country is getting less religious, not more, but the most religious are the ones shouting the loudest. All God's (mature) chillun have trouble sleeping at night. It's a function of age, not belief or disbelief in anything whatsoever. Gone are the nights of long periods of peaceful restorative sleep.They abandoned you along with your flat belly. Still, it's better than being dead. Yes, the litany of our personal beliefs are complex and powerful. E.g., I believe my lover loves me. Except for that time s/he . . .
My friends love me . . . but who are they? Where are they when I need them? My parents love(d) me unconditionally, and yet they were always upset when I -- fill in the blanks. Frame this debate not around a detached principle like evolution, but around an aspect of nurturance such as parents ensuring that their offspring survive. See the nutshell. Comfort can be found in the fact that the feared religious influence is dominated by the Catholic Church, leaders of science, for lo these many years; a church which can lay claim to scientific advances from the birth of genetics to the big bang theory, radiation, rocket science, and so on. Evolution has been taught in Catholic schools for many decades. Google Jesuit Priest Pierre Teilhard de Chardin's Omega Point if you want to expand upon your concept of evolution. Let not your heart be troubled--let me paraphrase here--by what Republicans think. The way is prepared for us. You need not be religious to understand this. Just hold to the truth and be prepared to withstand challenges. "I'll tell you why it's not a scam in my opinion. Alright. Tide goes in, tide goes out. Never a miscommunication. You can't explain that!" The look on Silverman's face! BillO should've paid attention to his Junior High School science teacher. Tides were explained 317 years ago. In 1687, Sir Isaac Newton explained that ocean tides result from the gravitational attraction of the sun and moon on the oceans of the earth. Evidently we haven't evolved very far if you only have a choice between A & B. Even Starbucks gives more choices.